Once again, here we are with Damian reviewing a CD from a band he knew nothing about. It’s so funny because if you had told me when A&GS first started out how much Power Metal I’d be getting into less than a year later I would have told you to get off the crack, it’s screwing with your brain. And yet, albums from HUMAN FORTRESS, PRIMAL FEAR, and now SILENT FORCE have set up shop in my ears and my brain with no sign of them leaving anytime soon. That’s OK because I am loving these bands something fierce! 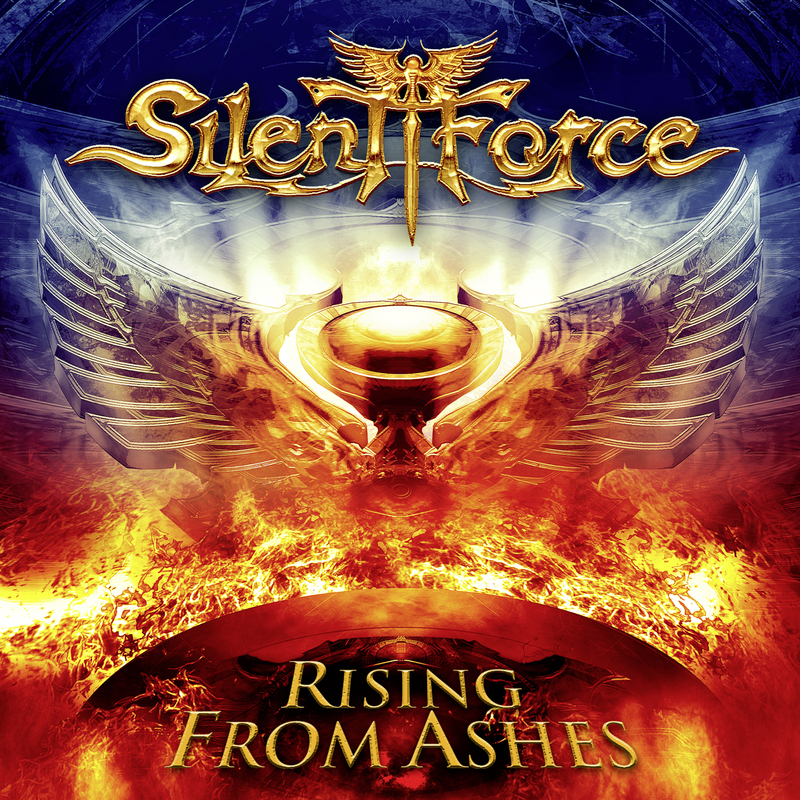 So without further ado, let’s get into SILENT FORCE’S new one, Rising From Ashes, out January 21 via AFM Records. First things first, opener “Caught In Their Wicked Game” bites down hard like a rattlesnake and doesn’t let go, Alex Beyrodt’s guitar riffs blazing a speedy trail for the rest of the band to follow, and follow they do, each member playing with fire and intensity. “There Ain’t No Justice” features Alessandro Del Vecchio’s keyboards higher up in the mix, adding the perfect complement to the guitars and making for one of the best songs on the record. Good luck getting this one out of your head; ain’t gonna happen! We head on over to the mid-tempo side of town for “Circle of Trust”, singer Michael Bormann’s delivery going from his lower register to his highs rather convincingly. One of the things that make this song is his ability to sell it. The guy can sing with conviction, that’s for sure. Oh man, the opening riff on “Living to Die” is the kind of thing you’d expect to find on Headbangers Ball back in the day, and for a metalhead from that era this is like crack to me! Same thing with “Before You Run”, but on this one drummer Andre Hilgers and bassist Mat Sinner are in control, anchoring the song on the verses and driving the rest of the band to really let loose on the choruses, especially Del Vecchio. Another great song, I keep coming back to it…a lot. “You Gotta Kick It” had to grow on me, but it definitely did by third listen. Another song that I fell for right from the start was “Turn Me Loose”. Again, Bormann’s vocals totally make this one. The blend of heavy and melodic is perfect on the whole album, but this track especially. More balls-out riffage permeates much of “Born to Be a Fighter” and when Beyrodt and Del Vecchio go back and forth on the all-too brief solo you’ll find yourself wishing they’d jam a bit longer. The anthemic hook of “Anytime Anywhere” will definitely have people moving if they do it live and is another choice cut. Final number “Kiss of Death” is one of the heavier songs and coupled with the opener makes for perfect repeat listens. Before you know it you’ll have played Rising From Ashes six times in a row, and as you sit and wonder how the hell that happened, chances are you’ll be ready for number seven.